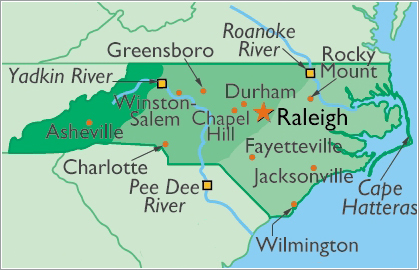 Council Members serve many areas in North Carolina. Click on the area links to the right, the map above, or scroll down to find help in your area. Asheville Area: Waynesville, Asheville, Hendersonville and surrounding areas. Charlotte Area: Hickory, Gastonia, Charlotte, Concord, and surrounding areas. Triad Area: Winston-Salem, Greensboro, High Point, and surrounding areas. Raleigh Area: Chapel Hill, Durham, Raleigh, and surrounding areas. Fayetteville Area: Lumberton, Lumbee Community, Laurinburg, Fayetteville, and surrounding areas. Wilmington / Jacksonville Area: Wilmington, Jacksonville, and surrounding areas. Rocky Mount Area: Goldsboro, Wilson, Rocky Mount, and surrounding areas. We can provide you contact with various elder care services in the Asheville Area. Although this area is temporarily without a member to assist you we can still help you solve any concerns or problems you may have. Please contact the North Carolina Senior Care Council by clicking on the link below. We can provide you contact with various elder care services in the Charlotte Area. Although this area is temporarily without a member to assist you we can still help you solve any concerns or problems you may have. Please contact the North Carolina Senior Care Council by clicking on the link below. We can provide you contact with various elder care services in the Triad Area. Although this area is temporarily without a member to assist you we can still help you solve any concerns or problems you may have. Please contact the North Carolina Senior Care Council by clicking on the link below. We can provide you contact with various elder care services in the Raleigh Area. Although this area is temporarily without a member to assist you we can still help you solve any concerns or problems you may have. Please contact the North Carolina Senior Care Council by clicking on the link below. We can provide you contact with various elder care services in the Fayetteville Area. Although this area is temporarily without a member to assist you we can still help you solve any concerns or problems you may have. Please contact the North Carolina Senior Care Council by clicking on the link below. We can provide you contact with various elder care services in the Wilmington / Jacksonville Area. Although this area is temporarily without a member to assist you we can still help you solve any concerns or problems you may have. Please contact the North Carolina Senior Care Council by clicking on the link below. We can provide you contact with various elder care services in the Rocky Mount Area. Although this area is temporarily without a member to assist you we can still help you solve any concerns or problems you may have. Please contact the North Carolina Senior Care Council by clicking on the link below.